Liz is a volunteer for the Retired and Senior Volunteer Program (RSVP) and a member of Volunteers of America’s resident band, The Wild Coyotes. The band played beloved classics like “On the Road Again” and “Sweet Home Alabama” before drawing raffle tickets for a small audience sitting all the way up front. 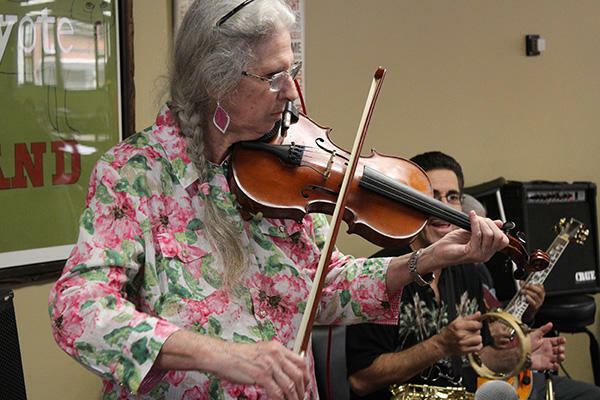 She travels from Centennial to play with them at Sunset Park every Thursday between 1-3pm. However, that wasn’t always the case. When asked about her late husband, Bill, Liz’s eyes light up. “He could play guitar and just any stringed instrument he picked up,” she recalled lovingly. After he began a battle with cancer, getting his music recorded became a priority. After finishing a CD, he unfortunately died, and Liz stopped playing music – saddened by the loss of her partner. It sounded perfect for her. After cancelling her senior group on Thursday mornings, (“This is so much more fun!”), Liz has been a part of The Wild Coyotes ever since. “It’s the highlight of my week,” she beams. Today Liz plays the violin with the band. RSVP assists those 55 and better in finding meaningful volunteer opportunities in which they can share their experience, abilities and skills for the betterment of their community and themselves. To learn more, contact Cathy Law at claw@voacolorado.org.